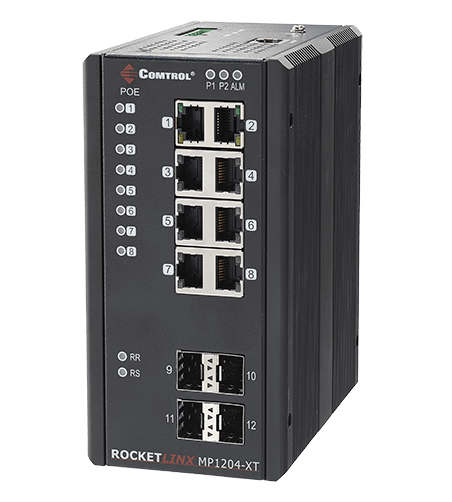 The RocketLinx MP1204-XT is a Gigabit 12-port industrial PoE switch with eight PoE Plus ports, which are IEEE 802.3af and IEEE 802.3at compliant, and also provides four SFP slots. The RocketLinx MP1204-XT is a Gigabit 12-port industrial PoE switch with eight PoE Plus ports, which are IEEE 802.3af and IEEE 802.3at compliant and also provides four SFP slots. The MP1204-XT provides an extended operating temperature range, which is ideal for IP camera, access point, and critical PoE devices. User Privilege16 configurable user privileges. Time SynchronizationNTP protocol with Daylight Saving Function and Localize Time Sync Function.